Martin Robson, a former Royal Marine Commando, began diving with the military in his late teens. He is now one of the best qualified Tec Diving Instructor Trainers in the world, teaching courses with PADI, IANTD and both of the major Cave Diver training agencies, NACD and NSS-CDS. Martin has worked for the UNESCO Maritime Archaeology Department recovering artefacts from un-dived wrecks as deep as 180m that are too delicate for recovery by ROV. He has also been a safety diver supervising underwater film crews. Following the death of a friend from Carbon Monoxide poisoning, Martin was asked to be an ambassador for a major gas analyser manufacturer and is working with them to promote the need to analyse diving gasses by giving seminars and presentations at events such as DEMA and other major dive shows. 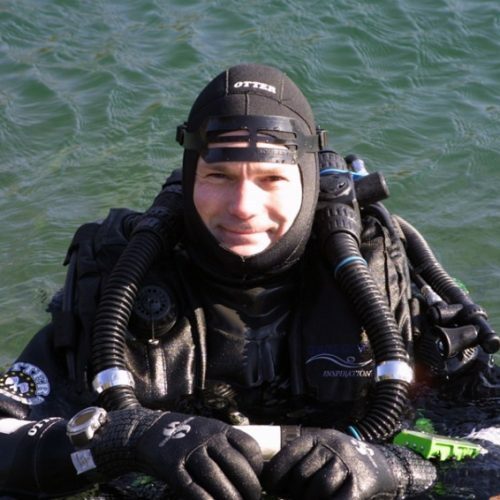 Martin's main passion is cave exploration and diving in extreme environments. Recently he has been exploring one of the largest karst springs in the world to depths beyond 200m in very cold water in an attempt to discover if a cave system is present and to locate the source of the water. copyright © 2019 Divestaff ltd. All rights reserved.